Our household has always had a "small" and a "big" camera. My wife typically uses the small one and I use the big one. (Once I got a Canon 20D SLR, the former big one became the "medium" one.) This Christmas, I figured it was time to upgrade the small and medium cameras, to get better resolution, low-light capability, storage capacity, zoom, movie capability... and lots of other things. For my wife, "pocketability" was the main factor holding her back from taking the camera everywhere, so the small camera got upgraded from a Canon S30 to a Canon SD700 IS. It actually has a bigger screen than the Canon S3 IS that we also got! Most of the familiar Canon controls are there, but in different configurations that present a bit of a learning curve for long-time Canon users. For example, the mode dial is on the side; review mode is a choice on the mode dial, so you can't just hit the shutter button to resume taking pictures; and "Manual" mode just lets you adjust things like flash and white balance, not shutter speed or aperture. I'll put a full review up on Epinions. This tip is all about ways to categorize pictures in multiple ways, without wasting space with multiple copies. One of my big challenges with photography is figuring out what pictures to use in different contexts. When I come back from a trip, I might want to pick one batch of pictures to print, and different batches to enter in camera club competition, turn into panoramas, and so on. Yet I'd also like to dump the whole batch of originals into one directory for ease of backups and viewing thumbnails. The way I have settled on organizing these different categories is with OS X's "alias" feature. Drag and drop one or many files while holding Option and Command, and OS X will create tiny files that point back to the originals. (The icons have little curved arrows in the lower-left corner.) Photoshop can work (reasonably well) with aliases; you can view their thumbnails and open them for editing. What I typically do is "Select All" in my Originals folder, and Option-Command-Drag all the files to a different folder. If it's easy to select a group of files, like a sequence of pictures all of the same subject, I'll only select those files before dragging. The other folder will be something like "Panoramas", "Black and White", or camera club competition categories such as "Travel" or "Pictorial". Once these folders are full of aliases, I can look at the thumbnails in Photoshop. At this point, the Trash Can becomes my friend. As I decide which photos are relevant for each folder, I can trash all the others through Photoshop or the Finder. The alias goes in the trash, not the original file. If the choices are not obvious, I keep a large set of aliases in the folder and flag only the ones I think are best. This way, the same picture can be flagged in one category, but not in another. You can use the same pictures in many different contexts without creating separate copies. I always wait until the pictures are converted to PSD before copying aliases. Each PSD is on the order of 20 MB. So it wouldn't be practical to file separate copies under Travel, Nature, etc. Any edits you make to the picture, either through the original or one of its aliases, are reflected everywhere. For example, if you improve the contrast while preparing a photo for a camera club Nature competition, you'll see that same improvement when you go back to the Originals folder to make a slideshow. Any dust removal, Levels, and so on only needs to be done once. For pictures that I want to try as black and white, I'll create the Channel Mixer adjustment layer, but turn it off before saving, so the B&W effect does not show up in all the other folders. I find that having folders of just the relevant photos is more convenient than assigning keywords in Photoshop for all the different categories and doing a keyword search -- less typing, fewer dialogs, and the finality of trashing photos that didn't make the cut is reassuring. Now, Photoshop's support for aliases is not perfect. Although you can do things like flagging and ranking, where Photoshop remembers your choice, you can't go through aliases to assign metadata that's stored in the file itself. So any keyword assignment has to be done using the originals. I'll typically go through a folder of pictures from Yosemite and assign relevant keywords like Deer, Hawk, etc. and then filter by keyword to identify all the pictures to create aliases in my Wildlife folder. The other big drawback with Photoshop's alias support is that you can't run a batch operation on aliases you've selected. If you want to boost the saturation of every picture by using Automate->Batch and an action, you've either got to go back to the originals, or open all the files and choose Opened Files in the batch dialog. When sending photos to get printed, you typically need to crop them to a particular aspect ratio such as 4x6, 5x7, or 8x10. Although you can sift through aliases to pick out candidates for printing, be careful not to save the cropped version and overwrite the original. What I typically do is to make a selection using the Marquee tool with a fixed aspect ratio, and then do Select->Save Selection and give it a name like "4x6 Crop". I might even save more than one selection if I plan to make both a snapshot and a framed 8x10 of the same picture. I save the uncropped version after doing "Save Selection", so that I have the full-sized original, but at any time I can load it, load the selection, crop and save the cropped version under a different name for printing. The first thing to remember is, since the ball is coming off the racquet with greater force, all things being equal, you can slow down your swing a bit and hit the same type of shot as before without any extra strain on your arm. This is especially important to keep in mind with any kind of awkward shot, like a wrist-flick to save a ball that's almost out of reach, or a desperation drive down the line while running wide. Don't hit these as hard as you can; chances are you're off-balance or not using ideal form anyway. Step into the ball, so much of the force comes from the forward momentum of your body. Swing early and smoothly, don't wait until the last moment and make a rushed swing. Get the ball out in front, don't let it crowd you or get behind you. Get racquet speed by turning your hips and shoulders. I find it especially useful on the forehand to bring the left arm around as well as the right, and start the forehand by turning the shoulders so it feels like the left arm pulls the right along with it. Keep wrist motion to a minimum; get the racquet in position and on course early so you don't need any last-second adjustments with the wrist. Since John and I are both vegetarians, I keep running across variations on Stuffed Acorn Squash recipes as suggestions for Thanksgiving and holiday dinners. In fact, this was my choice of entree at our Thanksgiving dinner at Millennium. I decided to create my own version for our dinner the day after Thanksgiving. Since John prefers not to have to separate out skins or shells from his food, I baked one each regular and one Japanese white organic sweet potato, peeled and mashed them (one on each side to maintain the two separate colors) as a low bowl. 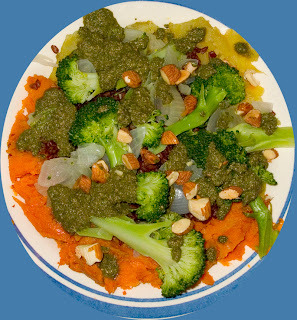 I drizzled freshly-made pesto on these, and then filled the center with bhutan red rice, and added organic broccoli, onions, and chopped almonds and more drizzles of pesto. This was a rousing success and was heartily enjoyed by all! I would like to dedicate my first food blog post to two of my favorite food bloggers, gluten-free girl and vegan lunch box, who write passionately about eating on diets limited, but not restricted, by health or ethical reasons. You are truly inspiring! I hope everyone has a wonderful holiday. iPod, oh iPod, Where Art Thou? When John bought his first iPod, it came with a bright blue case, and so was fairly easy to find. 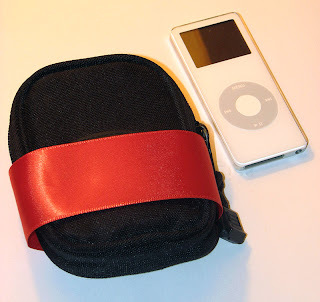 By the time he bought his 3rd iPod, the Nano version (which we affectionately call "Nanoo"), he also had a Palm, a cell phone, and a digital camera, all stored in small black cases. We took Nanoo on a trip in May and hadn't seen him since we got home until mid-November, when John did a massive desk clean-up and found the little black case resting quietly under some larger items! So my (self-imposed) project for the Thanksgiving week-end was to make the case more visible. I showed John the choices of colored ribbons I had available, and he rejected pink (you think?) for this pumpkin version. I gave the black case a kind of belt. I joked with him if I was Martha Stewart I would have needlepoint hearts or flowers on it! We haven't lost Nanoo since! When exactly would you use an adjustment layer that's not at 100% opacity? Seems like a silly thing to do. If the effect didn't turn out exactly right, wouldn't you just re-do the layer from scratch or tweak its slider settings? That's the way I worked for a long time, and still do in most cases. But there are certain times when it makes sense to create an adjustment layer that goes too far, then dial it back a little by lowering the opacity using the slider in the Layers window. That's a different technique than, say, applying a gradient to a layer mask to darken the sky but not the foreground. When a photo has a colour cast, the natural adjustment is to do a Levels layer and set the Gray Balance. However, sometimes the photo doesn't really have any gray -- the rocks, street, or whatever is made out of the wrong-coloured material, is under reddish sunset light, and so on. In this case, pick the closest-to-gray colour to apply the Gray Balance, which will swing the whole photo too far towards blue, yellow, or sometimes magenta. Instead of endless re-doing the Gray Balance looking for an elusive speck of pure gray in the photo, lower the opacity of the Levels layer until you find the accurate-looking percentage. When a subject is a little too dark, but the background is pretty much the right brightness, I like to apply a "spotlight" effect by doing a Levels layer and using a circular gradient for the layer mask, centered on the person's face, their whole body, or whatever subject is too much in shadow. But sometimes, the Levels adjustment that makes the subject look realistic is too bright to blend well with the rest of the picture. In this case, lower the opacity of the Levels layer until the falloff in brightness is imperceptible. You'll still have the "ideal" Levels adjustment setting that you can apply if later you decide to sacrifice the background by brightening the whole picture. I don't use shared drives on OS X as much as I would like. It sounds great in theory: access a folder or entire hard drive on one computer, when it actually lives on another. Using drag-and-drop is simpler than ftp for copying files over to the laptop, or sharing song files between two computers, or editing a file from a different computer without making a separate copy. In practice, this technique has always had a few glitches. OS X tends to be clumsy when you're connected to another computer and then that other computer goes to sleep, or you start a VPN which cuts off all other network connections. You might see a complete freeze for several minutes before OS X realizes the other computer isn't responding. You'll see that freeze at random times, for example when OS X puts up a File Save dialog and decides to check all connected drives. Once it decides the shared drive is kaput, you have to reconnect, which involves a sequence of dialogs even if you've stored the password in your keychain. Lately, OS X has been improving in this area. There hasn't been as much freezing, the timeout period is shorter, and when the error dialog comes up, you can unsleep the other machine and the operation goes ahead without you having to reconnect. One time-saving tip that I just discovered recently: If you make a shortcut to a folder on a shared drive, you can drop a file on the shortcut, and the shared drive is automatically mounted without any password prompts or other dialogs. The file is copied, and the shared drive stays mounted. I use this trick to do timed audio recordings on one computer, then shoot them over to the Music folder on another computer, even though most of the time the shared drive isn't connected. To make the shortcut, drag the original item while pressing Command and Option, so the mouse pointer changes to a little curved arrow. The next trick will be to figure out some way to auto-mount the drive in the absence of a file I really want to copy. Perhaps have some dummy file that always gets copied to the same place. Also, this technique doesn't work when copying a file from the command line. The copied file just overwrites the shortcut. With a 24-inch screen and a DSLR that takes super-sized pictures, cropping is more of a concern than it used to be. Here's some Photoshop advice to make the process simpler. Use the Marquee tool to make a rectangular selection, then the Image->Crop menu choice, rather than the Crop tool. Using a selection gives more flexibility than the Crop tool, for example the ability to make a selection with a fixed size or to save selections as alpha channels. If you plan to make a photo print of the picture, make a selection with a fixed aspect ratio of 6x4, 7x5, 10x8, or whatever dimensions you plan to use for the prints. Reverse the numbers for pictures printed in portrait style, i.e. taller than wide. If you need to have different-sized crops of the same picture -- for example, to print both a 4x6 and make an 8x10 enlargement -- make the selection and choose the Select->Save Selection menu item. Save the selection as an alpha channel. You can make several selections this way with different sizes, save them as part of your .psd file, then later do Select->Load Selection and Image->Crop. Just remember to always save the file under a different name after you've cropped it. If you will be projecting the photo or displaying it on a laptop, crop using an aspect ratio that matches the projector or laptop. For example, my local photo club uses a projector with 1024x768 resolution, so I crop competition photos to an aspect ratio of 4x3. That way, I can always resize the cropped image to 1024x768 and not lose anything. For pictures where the subject doesn't take up a lot of the frame, such as a wildlife shot taken from a distance, consider doing an initial crop to match the dimensions of your monitor. You'll need to use the rectangular Marguee technique with options set to a fixed size. That way, you can do the rest of the work looking at the picture at 100%, and only later decide whether to crop even more. This technique works best if your screen resolution is greater than on the projector, laptop, etc. where the picture will end up. For example, I do my photo editing on a 1900x1200 screen but typically display slideshows on a 1280x960 laptop. If I am reviewing and working on dozens of surfing pictures where the surfer is surrounded by lots of ocean, I can work faster and save disk space by cropping out lots of blue. Using an absolute size of 1900x1200 means I don't have to worry about cropping out too much, there's always some excess to trim later. Once you've made a selection, you can preview how the cropped version will look by pressing Q to go into Quick Mask mode. The part of the picture outside the selection turns red, so you can visualize how the photo will look without the extra parts, the same as when you select with the Crop tool and it darkens the unselected portion. Quick Mask mode has many other uses, but for cropping purposes, just press Q again to go back to normal. Once you've made a selection, you can resize or move it with the Select->Transform Selection menu choice. Press Enter once you are satisfied. By default, the transformation ignores any size or aspect ratio options; hold down Shift while resizing to keep the selection consistent with those options. I find it inconvenient not to have keyboard shortcuts for Image->Crop and Select->Transform Selection. In Photoshop CS, you can assign your own keyboard shortcuts with Edit->Keyboard Shortcuts. Photoshop already has shortcuts using most combinations of letters and modifiers, but whatever operations used Shift-Command-C and Command-T, I never used 'em and so reassigned them to Image->Crop and Select->Transform Selection. I recently recommended the Canon S3 IS to some friends as a good choice for a modest-sized camera with good zoom, good picture, and good movie capability. With my reputation behind it, what choice but to buy one too? I'm already finding it very educational, with a live histogram showing how well the picture is being metered. The dedicated movie recording button is also a boon. Look for a full review soon on Epinions. You know it's time to upgrade memory in the new Intel iMacs when it starts to make noise. Every switch between one big program and another involves grinding and endless waiting. Even switching to Finder or Terminal can be interminable. You start regretting keeping all your songs in one iTunes library, or keeping Firefox open with a week's worth of backlogged tabs. Unfortunately, the stock memory comes as 2 512MB modules. Meaning any upgrade you do means selling or otherwise disposing of one or two old memory chips. You can upgrade from 1GB to 1.5GB by swapping in one 1GB module, or to 2GB by swapping in two 1GB modules. Upgrading to 3GB is way too expensive still, with 2GB modules running from about $600 all the way up to $900+. The little latch door on the bottom of the iMac screen is easy to get off with a small eyeglass-size screwdriver. The screws are attached to the door so they can't get lost. The old modules come loose when you push on a couple of plastic levers. If you don't seat the new modules firmly enough, when you power up you won't hear the chime and the light flashes steadily. Since you might have to fiddle around with the chips a couple of times, leave the latch off until you've successfully powered up again. With the extra memory in, you should see an immediate speedup in application switching or user switching. An application like Photoshop can be running a batch job while you switch over to iTunes or Firefox with everything running at full speed and no grinding (technically, paging). Looks like I'll have to be on the lookout for Taj Mahal sightings when I go to Shattuck Ave. for lunch! I Ain't Gonna Get No More Socca! (At least in this location.) Too bad, they were just about to go on my list of Berkeley-area pizza places! It's an experiment. We'll see. I like how categories spring into being when referenced. So do stub articles -- create a link to a non-existent article, and the link goes red to show it's for future expansion. Follow the link and you're editing the article. Lotus Organizer. Back before the abomination of Notes, Lotus actually had a product that was enjoyable to use. ("To get away from Lotus Notes" is one of my stock answers to the question of why I left IBM.) You could link disparate things together in many-to-many relationships. I'm also interested in the ease of getting pictures into the system, auto-thumbnailing, and how well the text flows around a layout with a lot of pictures. You know, all those travel stories with dozens of links off to photos, rather than photo galleries where all the text takes the form of captions. The real test will be, how easy is it to get data out? Printable format for informal to-do lists. XML export format for bringing stuff up to my personal site. Copying the MySQL database to sync with another MediaWiki instance. These aspects are yet to be explored. But by wading through dozens of mini-reviews on Yelp etc., I pieced together that they really do have some vegetarian dishes. And it's true. I especially liked the sesame balls with lotus seed paste. In addition to half a dozen vegetarian choices on the dim sum menu, there is a vegetarian section on the regular menu and we ordered a couple of larger dishes there. (Mongolian faux beef for me, veggie chow fun for Lotus.) The only knock on the veggie offerings is that both the dumplings and the potstickers were jammed full of mushrooms and nothing else. A bit more variety there would be welcome. All in all, a nice find now that Long Life Vegi House in Berkeley has stopped doing weekend dim sum. Previously, I did some monitor calibration by eye using various test charts. I finally tried out some real calibration equipment (the Gretag Macbeth "Eye One Display 2"). Now, I know someone in the business of high-end color management who scoffs at all the consumer-level products. So my expectations are not sky-high. Running through the wizard on the Easy setting turns out to be a snap. Just hang the mouse-like contraption over the front of the monitor, let the software flash different colors on the screen to be measured by said contraption, and it's done. Watching the software do a binary search with white and black squares to locate the sensor against the screen is kind of entertaining. I read one review (ehhh, can't find the link now) that concluded that the Eye One Display actually was more accurate on the Easy setting than the Advanced one, so I left it at that. (Ran the process on new 24" iMac, old 15" iMac, and old 15" Aluminum Powerbook.) I can say that, subjectively, I do see some difference, with reds and blues looking a little deeper. The real test will be working with skin tones, gently graded skies, and high-contrast scenes. My skepticism about color profiling comes from the fact that most color problems I experience are rooted in the camera (3x Canons). The S30 takes pictures that are a little too saturated. The G3 tends towards too much yellow in the color balance in any kind of tricky lighting. And The 20D oversaturates the reds (by about +15 in Photoshop terms) in any picture with big patches of red. After a couple of days of use: I am actually seeing over-saturated reds now on the monitors, both flesh tones in news photos and solid red patches in GUI apps. The next test will come on Tuesday, when I'll have a couple of post-calibration images projected in the local camera club competition. If you interrupt the analysis, iTunes tries to run it again for your whole library the next time you import any music. If you use the technique of removing the iTunes library data file, and re-importing a modified XML data file, iTunes does the analysis yet again! The "gapless / not gapless" setting isn't preserved in the XML file. I've used this technique several times recently while moving songs between hard drives, and the constant "analyzing songs for gapless playback" is driving me up the wall. How often do you actually listen to an entire concept album with shuffle turned off? I'm much more likely to hear a song from "The Wall" as part of some playlist. For me, it would be more useful to have a way to join two songs into a single unit retroactively. You can join songs like this, but only when you rip them; neglect to plan ahead, and you have to go back to square one with that CD. I did learn a number of things -- some contradictory -- from the other authors. From flipping through the Annie Leibowitz book, I got some ideas about portraiture (always more to learn there) and black and white. Now digital cameras are still weak when it comes to dynamic range, making for less overall contrast in black-and-white shots. But my impression, which goes against the conventional wisdom, is that when taking a single exposure, it's better to underexpose a little rather than try to get the histogram concentrated in the brighter part of the range. The photos in he book seemed to bear this out (despite being shot on regular film rather than digital) -- the brightest parts were well short of being blown out, and some of the darker parts seemed solid black. Stevie Nicks was a special guest who sang on a couple of songs, and sang backup on some others. Stevie can still hit the high notes. This tour (for the album "Highway Companion") has been announced as the last from Tom Petty and the Heartbreakers. Tickets were hard to come by. The first two shows at the Greek sold out pretty much before the box office opened -- we were first in line but couldn't get two seats together in reserved seating. Luckily, this third concert was added, several weeks later. Interesting show. Good lighting. We had a great view of the sound guys and cameramen doing their thing. Each cameraman focused on one band member the whole concert, even when the lights were off them. I was jealous of one sound guy working 6 monitors at once. Canadian journalist and pundit Rex Murphy. I've always had a love/hate relationship with my tennis racquets. The good ones made playing a joy, the bad ones prompted endless frustration. Sometimes I played with free racquets from a sponsor, even if the model wasn't the best choice. Whenever I would switch to a new model, I'd always have a couple of excellent matches to start. Several times I had to borrow totally unfamiliar racquets due to broken strings or cracked frames with no spares on hand -- resulting either in total disaster (that would be the Canada Games), or inspiring heroics. The last few years, during my latest comeback phase, I've played with a very light racquet. It has great control for dropping the ball neatly into corners, the better to run opponents into the ground. But I was a little annoyed at not having enough oomph on shots to sock clean winners against speedy opponents, or having to finesse passing shots. Volleys seemed to require too much swing. It's interesting to look back at previous years, when I would try to adjust my game based on the characteristics of a racquet, or tweak my strokes based on the tension of the latest string job. I reached the point where I realized, if the ball is landing 6 inches out, I'm not going to change my swing, I'm going to get the strings cut out and re-done at a tension that works better with my natural game. In the same way, I'm not going to rework my serve or volleys, I'm going to experiment with racquets to find the one that works the best for my particular style. Years ago, I bought racquets sight unseen or after a single trial where they seemed to work OK. This time, I did a more thorough compare-and-contrast. I took out 2 prospects and tried them alongside the current racquet. Then 2 totally different models. Then the best of each group for a side-by-side comparison. Each time, hitting buckets of balls to check how each one worked for different shots. The one I settled on is the Babolat Z-OS. (Yes, a tennis racquet that could be confused with a mainframe operating system. :-) It does just the right amount of work on volleys and half-volleys. Spin serves curve down to hit the sidelines at sharp angles. Groundstrokes kick up high, topspin backhands stay in the court. When I tried the new axe for the first time "in anger", I could feel it in the wrist the next day. If the racquet is hitting the ball with more power, the force isn't coming for free. But soon I could play on successive days without ill effects. I'm taking this season off in the local tennis league; things are looking good for next season. Up to now I've mostly been concerned with interchangeable lenses for my digital SLR (Canon 20D), for different amounts of zoom and wide-angle. The only filters I have are UV filters that I leave on the lenses all the time, more for scratch protection than anything to do with the pictures themselves. I've been spending a lot of time cleaning up landscape shots by darkening the sky and/or lightening the ground though. Sometimes mashing together 2 or 3 auto-bracketed shots to get decent contrast in bright outdoor situations. I finally got a polarizing filter, and I can see that the editing time will be much reduced! There are 2 types of polarizing filters, circular and linear. DSLRs require a circular polarizer, whose effect increases and then decreases again as you spin its front element around. This fact triggers several interesting consequences. A circular polarizer would be useless if zooming or auto-focusing actually caused the lens element itself to rotate, because you could never rely on the polarizer to stay at the rotation where you left it. Cameras that do rotate their front lens elements must therefore need a linear polarizer, which I won't mention again. Because the circular polarizer has two pieces, the back that stays steady and the front that you spin around, it has the potential to be relatively thick. You can pay extra for a "slim profile" filter. (I did.) Now the DSLR owner has three things to spin around on their lens: the zoom ring, manual focus ring if you want, and the polarizer. Luckily, once you get into a bright situation with refections and glare, you can spin the polarizer to the setting you want and then leave it there the rest of the time. Although a DSLR like the Canon 20D does compensate for the decreased light coming in, that's at the expense of shutter speed. Be prepared to boost your ISO value by a couple of steps -- 400 where you might usually use 100, 800 the moment the daylight is anything less than bright. The polarizing effect doesn't apply equally in all directions, and its amount depends on the angle you are shooting vis-a-vis the angle of the sun overhead. You can predict where the effect will be strongest by pointing at the sun and tracing an arc directly perpendicular to it; the usual advice is to make a "gun" shape out of your index finger and thumb, aim your index finger at the sun, and rotate your wrist (or imagine doing so) and your thumb traces out a path that points at all the places where the filter will have the most effect. But I only find that useful for figuring out where to look as I turned the ring to gauge the effect. Looking towards reflective water, I could actually see texture appear and glare fade as I adjusted the filter. I've always been annoyed that Canon DSLRs by default produce photos with low saturation. I've actually got a Photoshop action set up to boost saturation, that I run practically all shots with. (In pictures with bright reds, sometimes the right adjustment is boosting saturation for blue and green, but leaving it unchanged for red.) However, now with the polarizing filter, I can see that this dull-looking default leaves room for the natural increase in saturation you get with a polarizer. Net result: My pictures taken against the sky or ocean came out much better than usual -- no burn out, good cloud definition, even correct exposure for an eagle in flight instead of the usual black silhouette. I had to boost exposure time and ISO maybe more than I'd like for a set of fireworks pictures, but those pictures had good colour that required less adjustment and saturation-boosting than normal. One other tip for shooting with a polarizer. Because the darkening effect on the sky varies depending on the direction, you might want to leave the filter off when shooting multiple shots for a wide panorama, to avoid uneven brightness in the sky. Recently I celebrated a birthday in high style. Because it was inconvenient to dine out on the actual birthday date, my wife and I spent the whole week treating ourselves at some top Berkeley restaurants. And by coincidence, I also got to dine at one of the top San Francisco restaurants the same week. Watch for a meal-by-meal account on my food blog. Played a tennis match over the weekend, mid-day in high '80s temperatures. The court was so hot, my opponent's inner tube exploded while we were sitting down on a changeover. Straight set win for me. When I was a skinny teenager, the heat was my nemesis. Now it seems like I specialize in winning on the most scorching days. I've learned... well, let's not give it all away here! One thing I notice, is that whatever things I bring to beat the heat, I've got more of 'em than the other guy. Woke up extra-early this morning. Felt like going for a row at Aquatic Park, which was my first time in a while. The bulletin board had a diagram showing a new course around the lake, to avoid patches of weeds. Well, I'm still learning the basic contours of the shore, so naturally I kept getting tangled in the weeds. Just like the Sargasso Sea! I finally happened upon a trick for untangling the oars, getting a little bit of speed and then spinning the oars entirely around while dragging them in the water. Not sure if that's the approved method! Here's the story from the San Francisco Chronicle. Keyboardist Vince Welnick was the last member to be added to the band. Playing keyboards for the Dead seems dangerous on the scale of playing drums for Spinal Tap. Welnick was also a member of The Tubes, who I vaguely knew but didn't know that they were also a Bay Area band. Well, it's my first look anyway. My neighbours asked for some advice about cameras. After I laid out all the considerations, they asked what I would get if I was buying a new camera of such-and-such size and capabilities. The Canon Powershot S3 sez I. So that's what they got. I like the 12x optical zoom, familiar Canon controls, and how compact and light it is. (More even than the G3 I think.) Review to follow. Today browsed around a little bit at the Epicurious Garden, a new gourmet food court in Berkeley's "gourmet ghetto", steps from the famous Chez Panisse. I had tried the gelato place before. This time I got one of the chickpea-flour mini-pizzas from Socca Oven, something new from the owner of Gregoire's just up the street. No wheat, no dairy, vegetarian choices -- can't go wrong there. Nice little eggplant-covered treat. A few weeks ago, Jeopardy held their online tryouts for the west coast. I didn't do nearly as well as the time I auditioned in person in Los Angeles. The categories were a little bit vague, the questions a little more America-centric than is good for me. In cases where I had to guess, later when I checked my guesses, they turned out to be mostly wrong. (During the in-person audition I did a year and a half ago, even my complete wild guesses were mostly spot on.) To even be considered for further consideration, I needed to get at least 35/50 right, and later in looking up answers I wasn't sure of, I found about a dozen that were definitely wrong. Since this test was for the whole west coast, I was extra nervous. There must be thousands of Silicon Valley geeks who would know their art history, American history, etc. better than me, who would take the test only because it was online. If too many people qualified, they might not let everyone audition, even if they qualified based on their score. About 2 weeks ago, I decided enough time had gone by that I hadn't made the cut. Until today, when I got invited to an audition in San Francisco in June. Excellent! Last time, I did great in the written test, great in the practice game, but didn't think I was that great in the practice interviews. This time, forget about cramming with trivia, it's all about being smooth in the interview! iTunes Cleanup: "Rolling Stones" vs. "The Rolling Stones"
As a database nerd, I'm bothered by inconsistencies in iTunes song data that seem easy to fix, but are too time-consuming for a large library. I'm using a combination of Perl & Applescript to simplify the process of cleaning up information that is similar but not identical across different songs and artists. I wrap everything in Perl, and call Applescript only when necessary. That way, people on Windows (or even Linux) systems could use the code to identify problems, even if the fixes required editing the song info by hand. And on the Mac, the relevant songs can be automatically put into a playlist for later editing or fixing via other Applescripts. For example, here's a little snippet that identifies all the artists who are represented as both "something" and "The something". Copy and paste it into the Terminal to run it. What this does is get an alphabetical list of all the artist names, with the initial "The" stripped off. If two consecutive names are identical, the full list of artist names included both the "The" and "no-The" forms. All the songs for an artist will be filed under a single folder, rather than separate folders for "Beatles" and "The Beatles" and so on. Makes it easier to copy or transfer the files via the command line. When going through the iPod "Artists" menu, you'll be able to get to all of the songs by that artist, instead of having separate entries with different groups of songs. Having consistent names makes it easier to check for duplicate songs and weed out other sorts of problems. Watch this space for more developments on this front! I've joined the Berkeley Paddling and Rowing Club, as a nearby place for both fresh air and fitness. My particular build responds very well to rowing, rather than running or heavy weights. I've got rowing in my blood from a great-uncle, Martin Boland, who was part of a record-setting crew in Newfoundland. Not only a record, but a record-setting record! The St. John's Regatta is the oldest continuously held sporting event in North America. The record stood for 80 years, which I believe (citation needed) is some kind of record for athletic records. Good review here of the free Oracle "Express Edition" (XE) database. I'm waiting (i.e. pushing) for a Mac version, and would like to see it offered by hosting providers. Regarding the GUI options... I've tried a lot of them, from various sources, and have never been impressed. But SQL Developer (formerly "Project Raptor") is growing on me! Some Prius-bashing in the NY Times op-eds today. The idea of Prius mileage "plummeting" on the highway strongly disagrees with my experience. In our first major trip in the Prius, from the Bay Area to Yosemite, we averaged 48.1 MPG in hours of highway driving to and from the Sierras. A Prius owner soon learns that although you can get great mileage downhill, going up and down the same inclined stretch of road burns more gas than an equivalent flat stretch. On days when I commute (an hour plus each way, all on the highway), I've noticed that I can increase my average MPG by 1-3, after a few days of purely around-town driving. If I reset the mileage figures at the start, I typically see 52 MPG for the highway commute, vs. around 46 for local driving. I've always heard that the city driving done by auto magazines is a little unrealistic, that they're babying the cars more than you could in real life. If so, perhaps the reviewers need to pay attention to the Prius's real-time MPG readout; ease up on the gas just a tiny bit at the right time, and you can maintain the same speed (or 1 MPH less) without the gas engine at all. Yes, even at high speeds on the highway. It's completely bogus for the writer to act as if anything labelled "Hybrid" is getting special treatment. Some non-hybrid cars qualify, and some hybrids don't. This article takes me back... or maybe brings me full circle! Back in university, learning UNIX was something you had to do on your own time. Here are some commands, they're documented online in "man pages", you figure out the rest and don't be late with your assignment. After university, it was on to IBM's documentation group for programming languages. Naturally, there was a lot of emphasis on online information. Programming languages lend themselves to hyperlinking to look up language keywords and API names. When AIX first came out, it had an online hypertext viewer (InfoExplorer) with a whole set of rewritten UNIX documentation. But customers didn't care much for an X11 application just to look up the syntax of ls. They wanted man pages, but didn't find any. I believe the customers finally got their way. On every UNIX-oriented project I've worked on since then, customers have griped that there weren't any man pages, or they couldn't be viewed from the desired context, or they weren't good enough. (Typically ignoring the whiz-bang online documentation tools that came with the product or OS.) I've had this gripe myself in Oracle's SQL*Plus, where 'help xyz' brings up man-style text help, but it hasn't always been installed. Now OS X comes along, with BSD UNIX under the hood, so once again my home computer work involves periodic use of the man command. And this article is the coup de grace -- a way to get the man output into the most elaborate viewers yet, Firefox and Acrobat Reader! To be fair, a lot of man pages are full of obvious flaws. There are some options and restrictions that were unclear when I read a man page 20 years ago... and now on OS X I see exactly the same murky text. 'man tar' and many others don't show enough examples. 'man rsync' puts the options too late on the page. Last night was the first time I saw the Critical Mass ride in Berkeley, rolling down Solano Avenue at 7:30. That couch looked pretty comfy! Article today in the SF Chronicle, a retrospective on the Japanese girl punk group Shonen Knife. I got introduced to them with their Let's Knife album, and was saddened to hear a few months back that their former drummer had died in a car accident. Suddenly, it feels like the possibilities on the Web are opening up again. I've set up an account at 1&1 Hosting, and mirrored my home page at JohnRussell.name. Got a couple of other domains reserved for exploring opportunities. Back in '93 or so, the Web was wide open for anyone who knew their way around Unix and a text editor -- and worked at a big company or went to a connected university. But after the boom and bust, things were kinda dull. Every unused domain was parked. People stopped having "home pages" and put away their FrontPage and DreamWeaver; now they had blogs, but still just content poured into a template with some ads around the sides. Now we've reached a point where things are once again interesting. You can hook up to Amazon web services, do a mash-up with Google Maps, sell music through the iTunes Music Store, run your own database apps for pennies a day. Every Internet account I've had has come with some paltry amount of web space, usually 10 MB; the 1&1 package has 15,000 times that (150 GB), plus scripting support and full shell access (allowing easy publishing via scp and rsync). Following on from the 24-hour rule from the previous post... tonight I learned Ruby in about an hour, including some exploration of branches like XML processing, Ruby on Rails, and RubyCocoa for the Mac. Takes me back to the days of Scheme and SNOBOL back in university. Since the advent of Java I've gotten bored with memorizing a zillion variations of IF syntax or array notation. But the way I could immediately grok Ruby made me think it really will be worthwhile to pursue. One of my most cherished maxims is that anything that's worthwhile to learn or implement, you should be able to do within 24 hours. I've found it's true for everything computer-related. If you get an idea in the morning, you should have a working prototype that evening. If you start researching a subject at lunchtime, by lunchtime the next day you should have developed some expertise in it. Conversely, if you can't get something working within 24 hours, whatever system you're working with is too user-unfriendly, or the idea is a dead end, or the methodology doesn't match up well with your mindset. This year, Santa brought a new Canon lens, 70-300mm to go on the Canon 20D that was last year's gift. 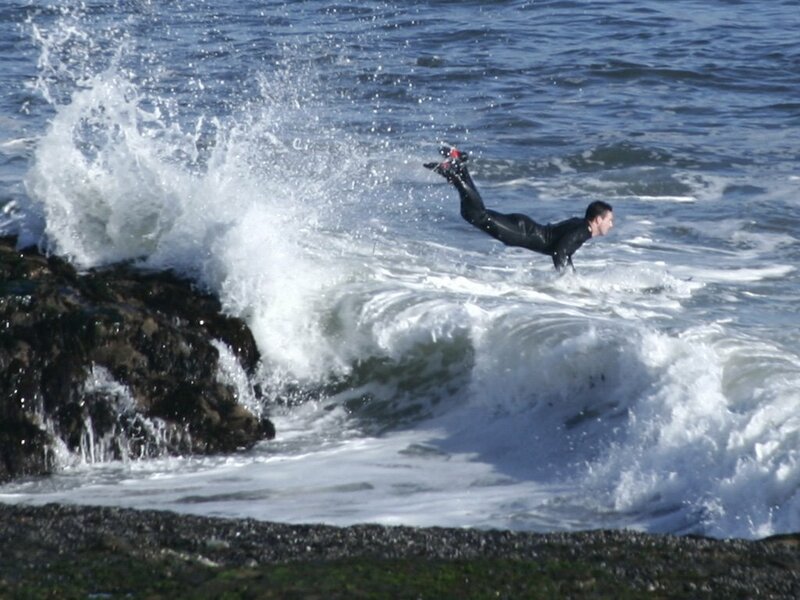 Recently, we took a vacation down to Santa Cruz where I took pictures of butterflies clumped together on tree branches, and wetsuited surfers riding the waves. In each case, I got some good pictures but only by extensive cropping, losing enough detail that it would be tough to enter those pictures in competition or get good prints. Hoping to use the new lens soon for some birdwatching pics along the SF Bay shore! This lens is the mid-range of Canon's 300mm lenses for mere mortals, that is, the ones without "L" glass. The highest-priced one is the super-compact DO model, which uses some optical engineering to give the same amount of telephoto without actually extending the lens. The lowest-priced one is actually a very inexpensive model without Image Stabilization (IS) or Ultrasonic motor (USM). I couldn't justify twice the $$$ for the DO lens just to make the camera easier to handle. I was very tempted by the cheapest model -- it should be affordable for anyone with a Canon SLR -- but the bigger and heavier the lens, the more important the IS and USM features are. No point in having a 300mm lens where I couldn't handhold a steady shot at full zoom! Over the Christmas vacation, I had all four wisdom teeth taken out. You'd think after 25 years of peace in the mouthal area, there would be some statute of limitations, but no. Luckily no complications, and I've noticed that I'm a bit lighter due to the week or so of cautious eating.